Remarkably good silk pile throughout, corroded silver metal -thread, a small spot repair in the centre, original fringes at one end, overall very good condition. Exhibited: K.K. O¨sterr, O¨sterreichisches Handelsmuseum, Katalog der Ausstellung orientalischer Teppiche . Handels-Museum, 1891. Note: The knot count is approximately 7H x 6V per cm. sq. Together with a subtle palette of powder blue, indigo, sage-green, peach and pale yellow the present carpet is woven with a heavily brocaded gold and silver field and a silver brocaded border. 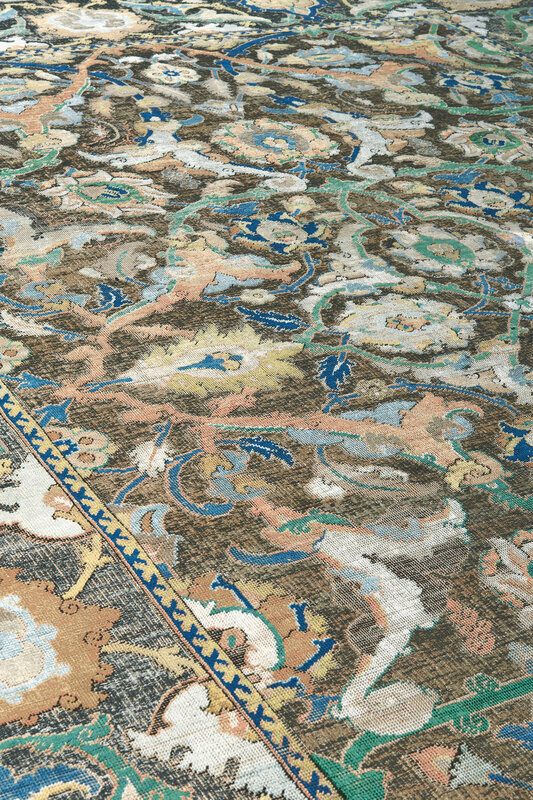 The hallmark shimmering silver and gold tones of ‘Polonaise’ carpets were achieved by wrapping extremely fine silver-gilt and silver thread diagonally around silk threads. 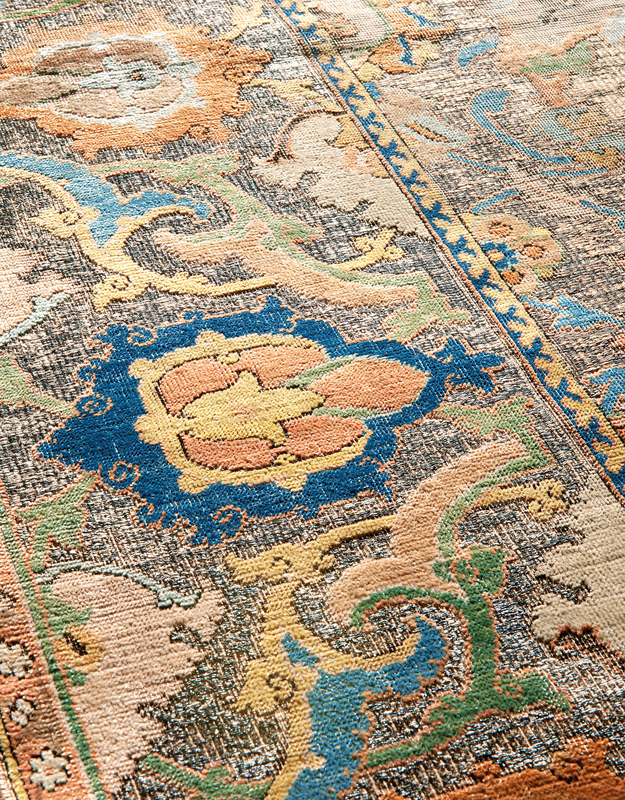 Naturally this effect has deteriorated with time due to wear and the oxidization of the metal threads which renders them dark, however it is still partially visible in some surviving rugs, such as the one offered here. Where the metal-thread has rubbed it has simultaneously revealed the technique used by the weavers whereby the silver metal-thread is wrapped around a white silk core, while the gilt-silver metal-thread is wrapped around a gold silk core. This was possibly intended to help heighten the tone of the metal where the silk perhaps showed through and helped the colours blend harmoniously into solid shades of gold and silver in the eyes of the onlooker. 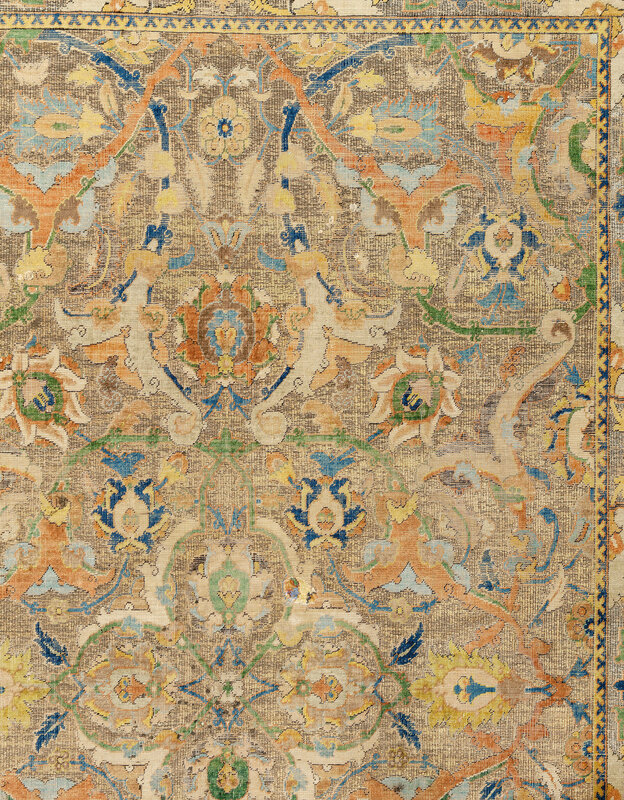 The design of the present carpet combines a floral decoration with elegant arabesques that overlays a secondary plane of scrolling stems terminating in lanceolate leaves. 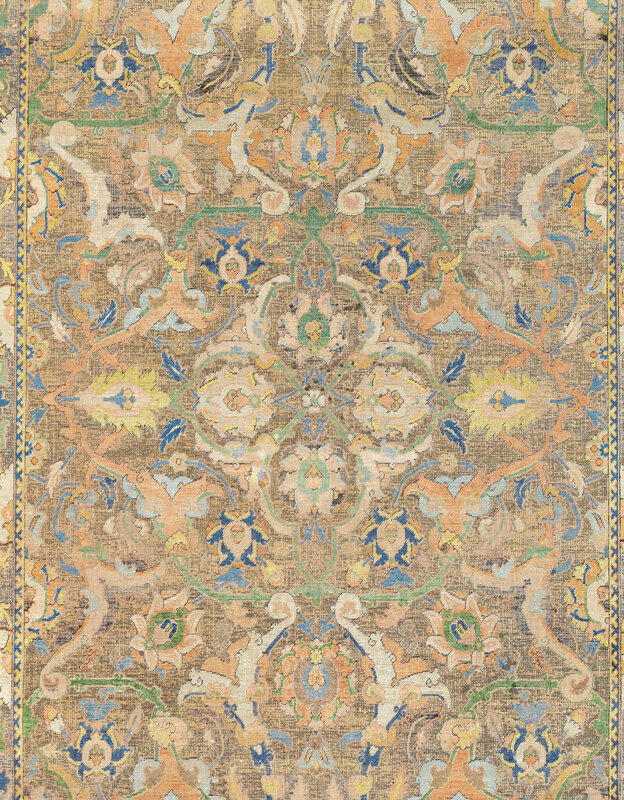 A carpet with a similar central quatrefoil medallion enclosed within an intricate lattice of scrolling tendrils is in the collection of His Grace the Duke of Buccleuch and Queensbury at Boughton, no.9 (Donald King, The Eastern Carpet in the Western World, London, 1983, fig.70, p.94). 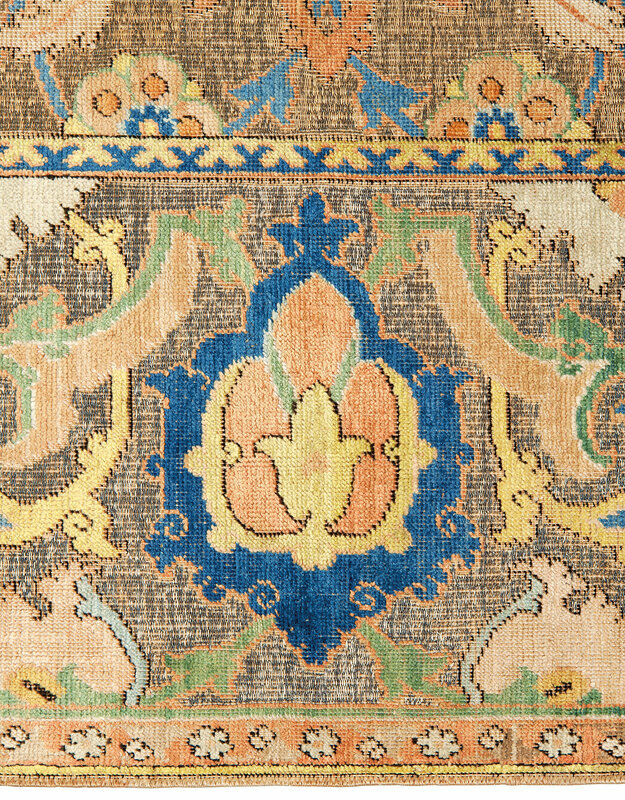 The border pattern of arabesques and palmettes on the Boughton carpet is calm and statuesque however the marginally wider border of the present carpet with its narrower guard stripes, allows the inverted pairs of split-palmettes that flank the alternating indigo and pale peach palmettes an even greater sense of balance and proportion. An almost identical border, but with a more vibrant red and orange palette, can be seen on a Safavid chenille carpet in the Rosenborg Castle, Copenhagen, (F.R.Martin, A History of Oriental Carpets before 1800, Stockholm, 1908, pl.13). 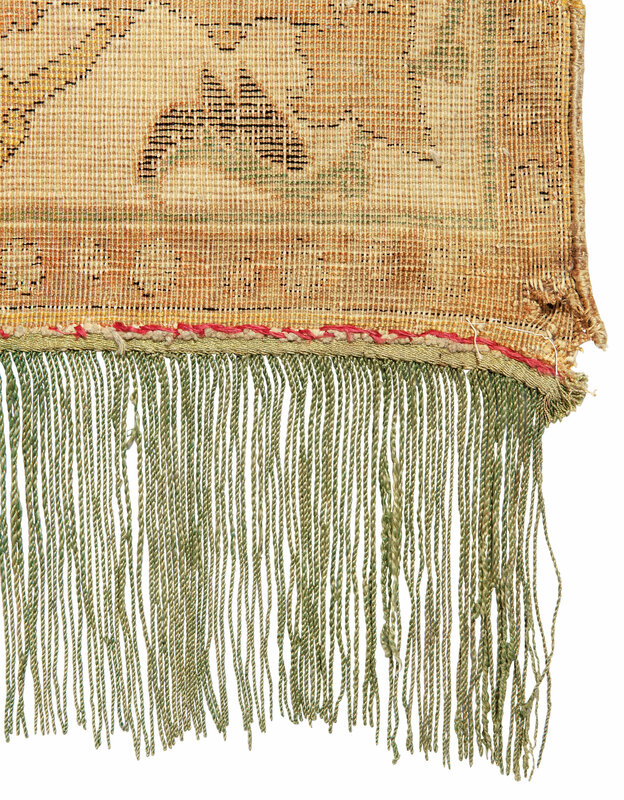 Remarkably the original long green silk fringes remain complete at one end of the rug and both ends are finished with an original silk and metal-thread braided kilim. It is highly probable that these two rare and exceptional ‘Polonaise’ silk and metal-thread carpets have remained together since they were first woven over 400 years ago. Produced in the first decades of the 17th century under the instruction of Shah ‘Abbas I of Persia, widely recognized to have been the most eminent ruler of the Safavid Dynasty that ruled from 1502 to 1722, they made their way to the royal Polish court. The family tradition has it that in 1695, the Saxon Elector and later King of Poland, Augustus the Strong, presented them to Lothar Franz von Schönborn (1655-1729), Prince-Bishop of Bamberg and Archbishop of Mainz, Archchancellor of the Holy Roman Empire. The House of Schönborn, especially its ruling prelates of the Roman Catholic Church, were among the most important builders of Southern German baroque architecture. In 1711 Lothar Franz Schönborn was instrumental in ensuring the election of Charles VI of Austria as the Holy Roman Emperor who rewarded him with a gift of 100,000 gulden. In 1710, Lothar Franz had ordered the construction of a private summer residence, Schloss Weißenstein in Pommersfelden, an impressively large baroque palace which was destined to house the largest privately owned art gallery in Germany. The palace was built between 1711 and 1719 from local sandstone which gave rise to the name Weißenstein, “whitestone”. The interior decoration was finished in 1723 and showcased the first ever grand stairway in the baroque style along with ornately painted interiors by Johann Michael Rottmayr and Johann Rudolf Byss. After the death of Lothar Franz in 1729, the palace passed to his nephew Friedrich Karl von Schönborn, and it is where the Schönborn family remain in residence today. 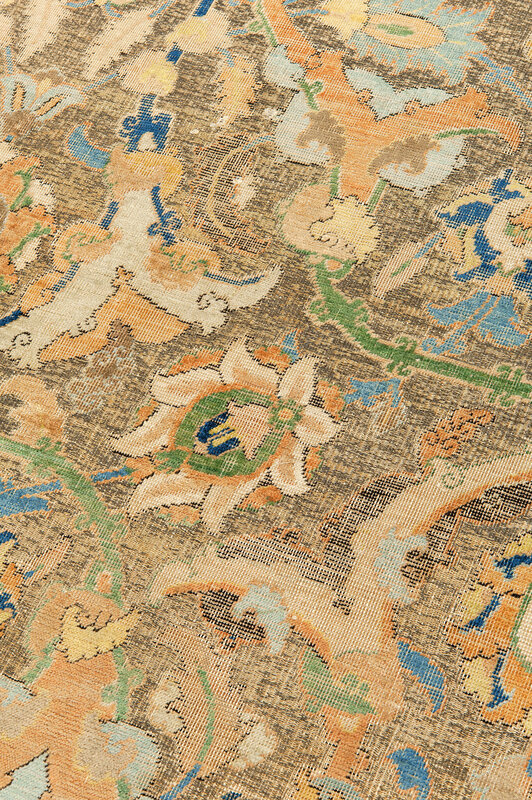 The family gave the name Schönbornzeit (Age of the Schönborns) to an era (1642–1756), sometimes nostalgically remembered in the popular conscience as an era of prosperity.According to Wilhelm Schonath, there were originally four ‘Polonaise’ rugs in the collection however these are not described in any detail, (Wilhelm Schonath (Hg. ), 250 Jahre Schloss Pommersfelden (1718-1968). Mit einem Lebensbild des Kurfursten Lothar Franz von Schönborn von Max H. von Freeden, Würzburg, 1968). The original palace inventory labels remain on each of the present carpets, preserving the legacy of their residency in the palace which oversaw many generations over nearly three hundred years. Each carpet is typical of the elegant designs produced in the weaving ateliers of Isfahan during the reign of Shah 'Abbas I (1587-1629). At this time, Isfahan was a thriving city, the court of a monarch who had completely changed Persia, having moved his capital there in 1598 from Qazvin. In contrast to the previous Shah of note, Shah Tahmasp, he welcomed foreigners with their trade and innovations in all fields. He even appointed an Englishman, Sir Robert Shirley, as his ambassador, to visit the courts of Europe and establish relations with Persia. He was a great patron of the arts. Isfahan today owes her fame as one of the most beautiful cities in the world more to his embellishments than those of any other period. The school of painting in the capital developed a new style, principally through the work of Reza 'Abbasi. This flowering in the arts was all the more notable since the latter years of Shah Tahmasp had been strongly influenced by his deep religious fervour which had resulted in his virtually closing the royal workshops. The contrast between the new Shah and his recent predecessor could not have been more marked. Shah’Abbas had a great appreciation for sumptuous textiles, silks and woven carpets, and production in Isfahan rapidly grew under his patronage with a number of workshops weaving simultaneously during the 17th century. 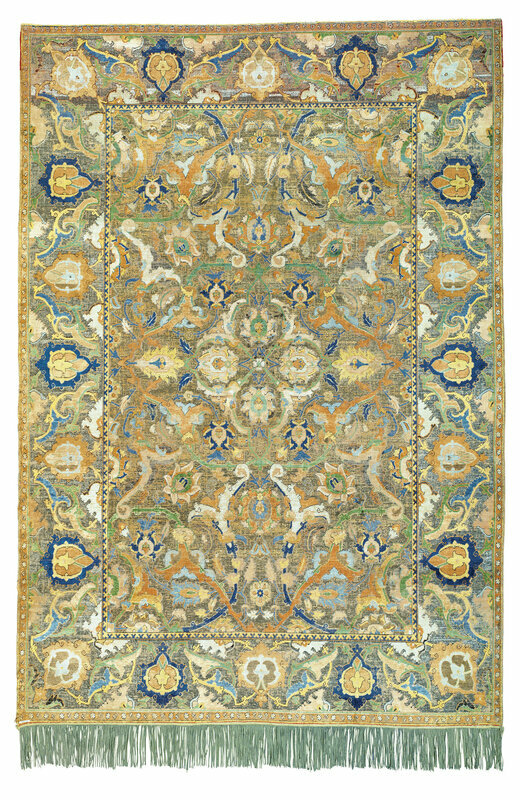 A number of these would have been working directly for the shah, producing carpets which were specifically commissioned to be appreciated locally. Two carpets of this group are known to have been given in royal waqf to the great Shiite shrine of the Imam 'Ali at Najaf. European visitors travelling to Persia at the time, commented specifically on the richness of the silk textiles and carpets that they saw. John Fryer in 1676 notes that Isfahan had special bazaars handling the sale of rugs "both woolen and silk, intermixed with Gold and Silver, very costly, which are the peculiar manufacture of this country (quoted by M.S. Dimand, and Jean Mailey, Oriental Rugs in the Metropolitan Museum of Art, New York, 1973, p.59). Other travellers who commented on the silk weavings in both Kashan and Isfahan, include Pater Florentino de Niño Jesus in 1607-8, Thomas Herbert in 1627-8 and Jean-Baptiste Tavernier in 1676. Sir John Chardin, who visited Persia between 1666 and 1672, also noted that the workshops were allowed, when they had time, to work for other clients as well as the Shah. 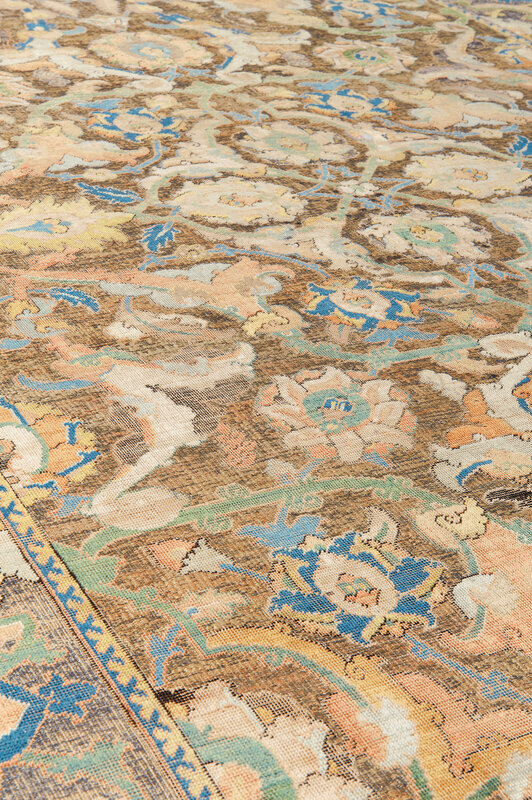 A large proportion of "Polonaise" carpets made at the time ended up in Europe where they found great favour with the Baroque nobility of the 17th century courts. They were given as ambassadorial gifts to deserving high-ranking officials, foreign emissaries and leaders of trade delegations. The Polish royalty in particular held a deep fascination for Persian works of art. Records show that in as early as 1584, King Stephen Báthory (r.1576-1586) acquired thirty-four Persian textiles, while in 1601 a group of eight Safavid silk carpets embellished with gold was ordered by Sigismund Vasa III of Poland for his daughter’s wedding, (Langer, op.cit. pp.118-123). These appear to have been delivered in 1602, some or all of which then passed by marriage into the Wittelsbach family and are now in the Residenz Museum in Munich. 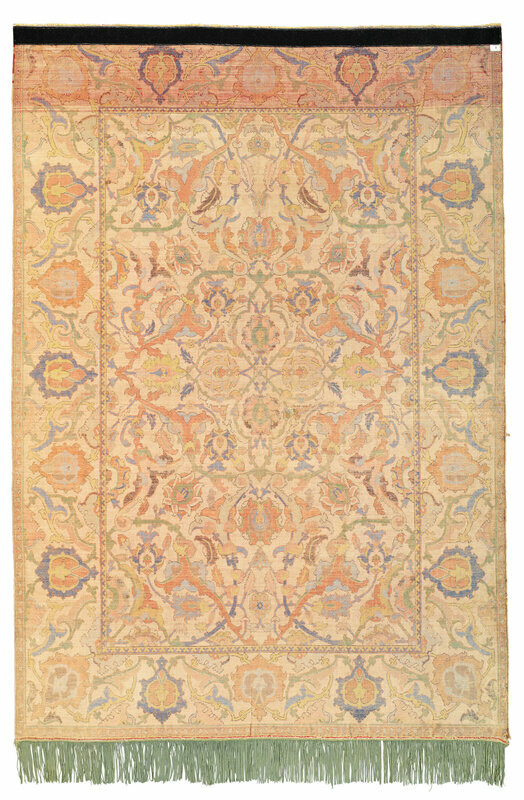 The term, ‘Polonaise’ was first coined at the Paris Universal Exhibition in 1878 where, in the Polish section of one of the pavilions, examples of this group of carpets belonging to the Princes Czartoryski, some bearing his recently added personal coat of arms, were exhibited publicly for the first time (Kurt Erdmann, Europa und der Orientteppich, Mainz, 1962, pl.36, pp.84-5). Visitors and journalists mistakenly concluded that these carpets had been made in Poland and it wasn’t until shortly after the exhibition had closed, that the true country of origin was discovered. The Polish attribution however, persisted, and these carpets still bear the name ‘Polonaise’ today. 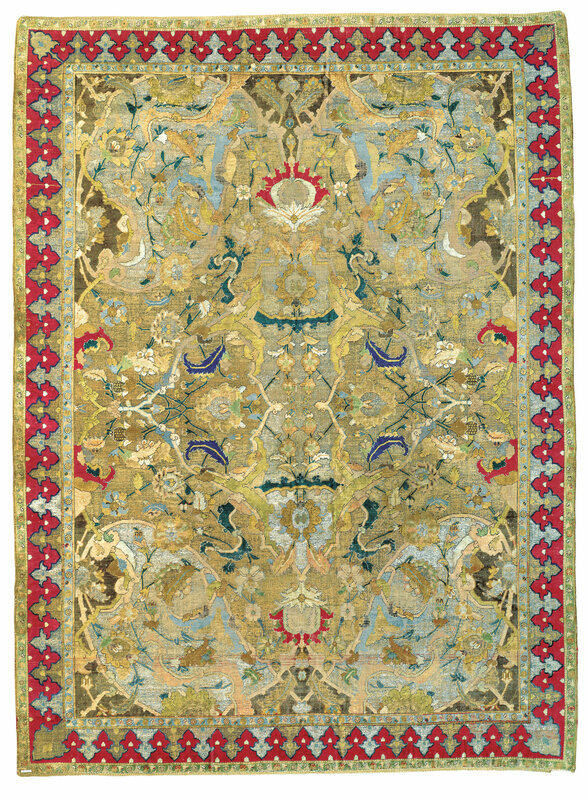 A few years later, both of the Pommersfelden rugs were exhibited in 1892 in the landmark exhibition for oriental carpets in Vienna, together with pieces of the Austrian Imperial collection, as well as those in the property of the royal families of Saxony and of Bavaria, the Dukes of Liechtenstein, and the Barons Rothschild. The catalogue contains hand-coloured illustrations of both of the rugs which help identify the colours and metals used and show their wonderful state of preservation at the end of the 19th century, (Alois Riegl, Beschreibung der abgebildeten Teppiche in: Orientalishe Teppiche, Mit Unterstutzung des K.K. Ministeriums fur Cultus und Unterricht (bearbeitet von A. Riegl) K.K.Handels -Museum (Hg.) Wien-London-Paris, 1892, , 1-22, pl.XXIII and pl.XXXV. 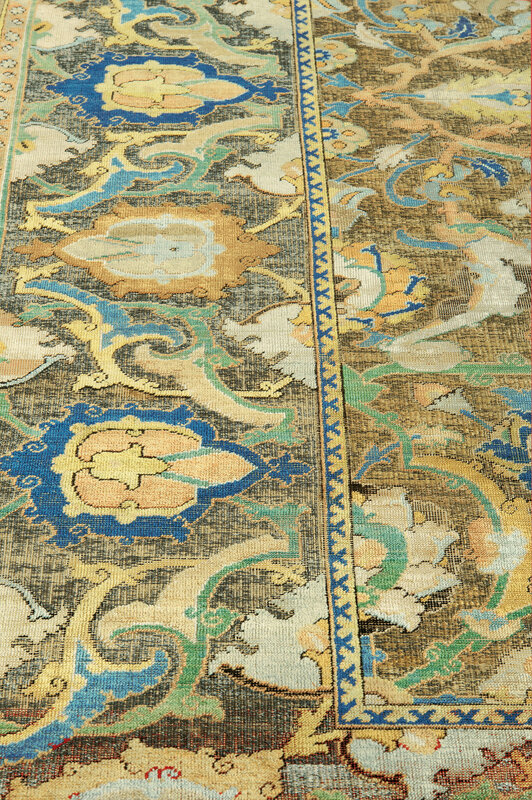 Most 'Polonaise' carpets were woven in brightly coloured silks on a cotton warp and silk weft foundation and incorporated gold and, or silver metal-thread which would have made their appearance both dazzling and brilliant. The absence of distinct lines, the lack of figural representations and an overtly baroque treatment of the individual details are other defining characteristics of the group, (Friedrich Sphuler, Preben Mellbye-Hansen & Majken Thorvildsen, Denmark's Coronation Carpets, Copenhagen, 1987, p.32). The absence of a single ground colour is replaced by curvaceous planes defined by scrolling stems in-filled with different coloured silks and gold and silver coloured metals These harmonious and balanced compositions of design and colour, although Persian inspired, were not however typical of Persian tastes but clearly corresponded to those of the West. 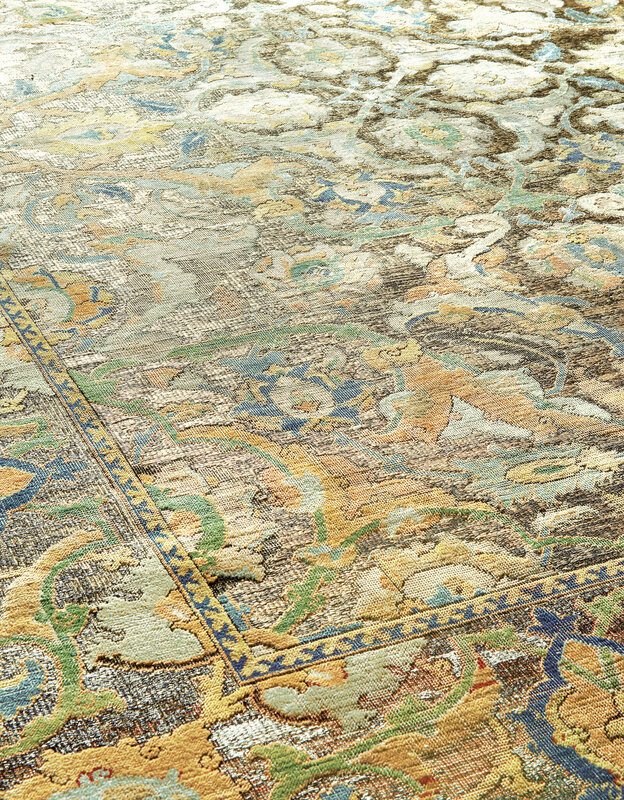 There are two references in 1599 and 1601 that indicate that Polonaise carpets were being produced in the last quarter of the 16th century but individual examples can only be dated on stylistic grounds. 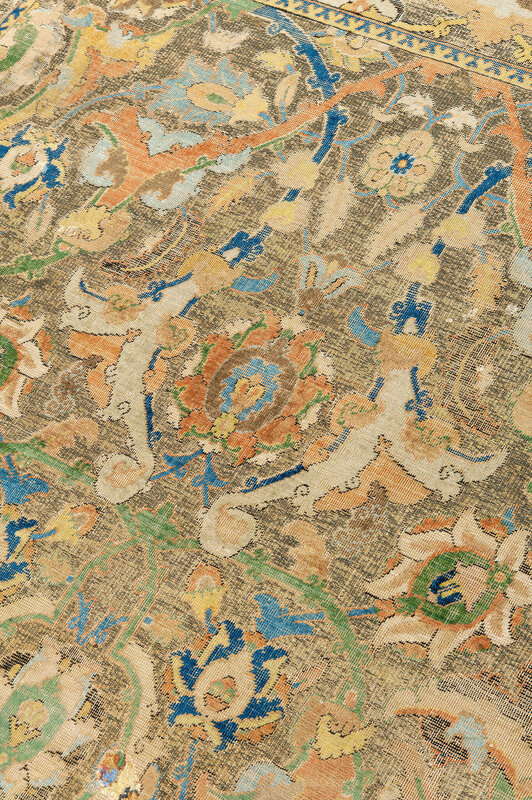 While it is generally accepted that the very best pieces were produced over a period of forty to fifty years starting from the first quarter of the 17th century, by the third, and particularly in the fourth quarter, ‘Polonaise’ carpets show an obvious degeneration and by around 1700, had widely lost their importance, (‘Entwurfspraktiken safawidischer Hofmanufakturen am Beispiel der sog. Polenteppiche’, Friedrich Spuhler, Hali, Autumn, 1978, pp.244-47). In his thesis on the subject, Spuhler documents around two hundred and thirty ‘Polonaise’ carpets, from which he draws the conclusion that many of the rugs either show identical designs, or take sections of endless repeat patterns and which are either then displaced by one width or are increased on a larger scale. 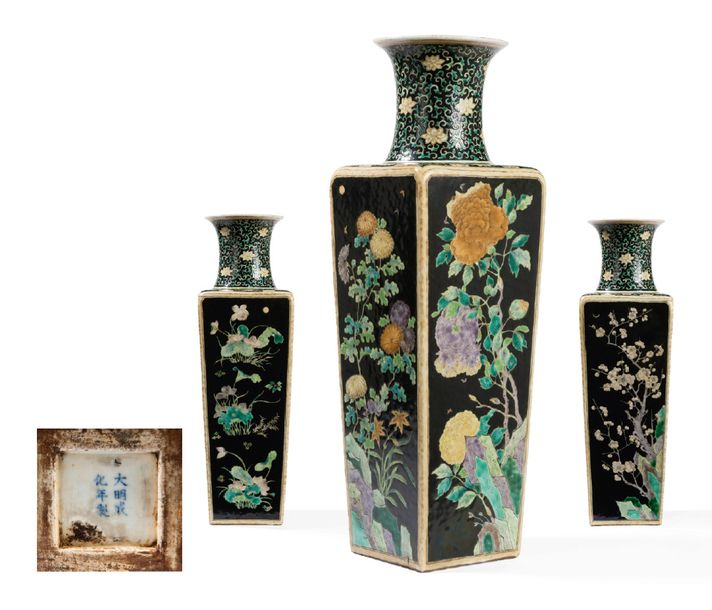 The field designs, with few exceptions, are based on thirteen different patterns and stylistically almost all seem to belong to the same period. Lot 254 in the present sale appears to conform to system VI,5, while lot 255, is that of system V,1. (Friedrich Spuhler, Seidene Repräsentationsteppiche der mittleren bis späten Safawidenzeit - Die sog.Polenteppiche, dissertation, Berlin, 1968, pp.223-4). 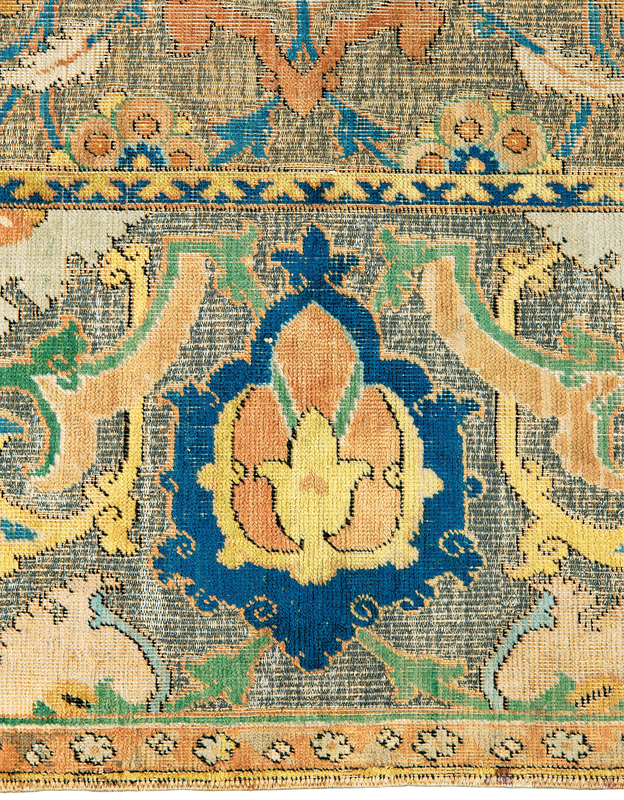 Of those examples that are preserved today, fifty-two are identical in field and border design as well as in colour and are therefore considered to have been woven as pairs and would likely have been displayed together on ceremonial occasions, (F. Spuhler, Islamic Carpets and Textiles in the Keir Collection, London, 1978, pp.108-9). Not including the present two carpets, which retain an astonishing amount of silk pile and a significant proportion of silver metal brocade, the vast majority of surviving examples seen today are now faded in colour as the dyes were fugitive and survive very worn and low in pile, due to the fragile nature of the silk. Woven during the golden age of Safavid art, it is only befitting that 'Polonaise' rugs with their silk, gold and silver-thread epitomize this era to many scholars and collectors today, who view these rugs with an appreciation equal to that of the European travellers visiting the Persian court during the first half of the seventeenth century. It is a rare opportunity to see two such wonderful examples that have survived in such astonishing condition.